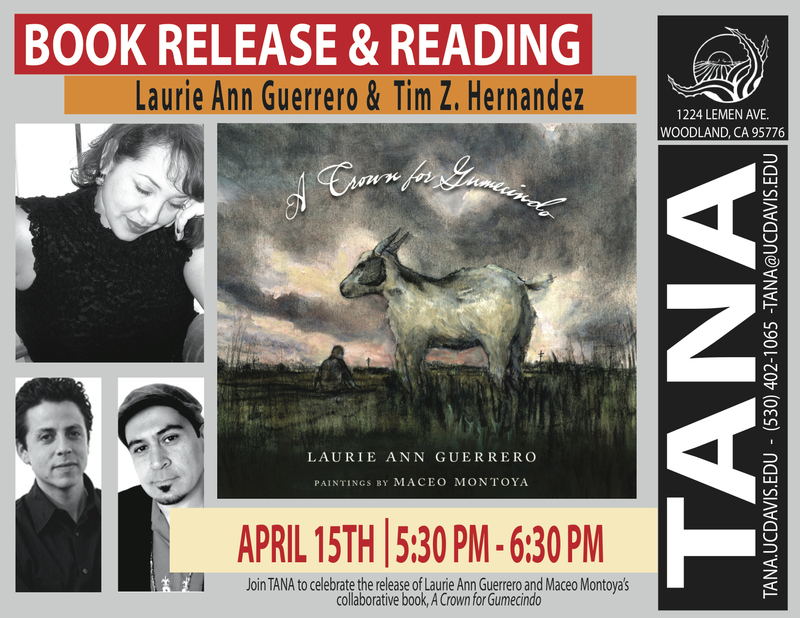 Join TANA in celebrating the release of San Antonio Poet Laureate Laurie Ann Guerrero’s new book, A Crown for Gumecindo, a special collaboration with UC Davis Chicana/o Studies assistant professor, Maceo Montoya, who painted fifteen original works based on Guerrero’s elegiac sonnets dedicated to her late grandfather. More information about the book can be found here. Laurie Ann Guerrero was born and raised in the Southside of San Antonio and received the Academy of American Poets Prize, among others, from Smith College. Winner of the 2012 Andrés Montoya Poetry Prize, her first full-length collection, A Tongue in the Mouth of the Dying, was selected by Francisco X. Alarcón and released by University of Notre Dame Press in 2013. Poets & Writers Magazine named Guerrero one of 10 top debut poets in 2014. We will also be joined by Tim Z. Hernandez, an award winning author and performance artist. His debut collection of poetry, Skin Tax (Heyday Books, 2004) received the 2006 American Book Award and his novel Breathing, In Dust won the 2010 Premio Aztlán Prize. In 2011 the Poetry Society of America named him one of sixteen New American Poets, and he was one of four finalists for the inaugural Freedom Plow Award from the Split This Rock Foundation for his work on locating the victims of the plane wreck at Los Gatos.